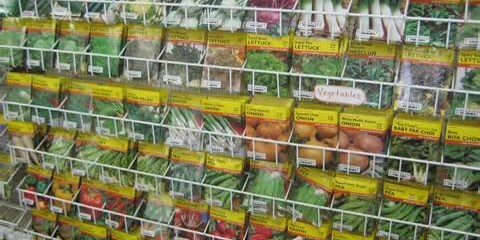 We went to the Garden Centre the other day and selected a load of different seeds (a mix of vegetables, herbs, flowers and fruit). It is amazing to think what we will be able to be eating in six months time for such a small financial investment – assuming of course that I am able to make them grow and the deer and other assorted wildlife don’t eat everything. Actually, wanting to grow our own food has nothing to do with finances, as my guess is that certainly this year and possibly permanently it will cost a great deal more to grow this stuff than it would be to buy it, especially if you take my time doing it into consideration. What it has got everything to do with however is personally doing away with one of my biggest annoyances which is to do with Supermarkets (well food shops generally) and out of season imports from far away places. It’s not that I am an eco crank but it seems madness to me that in a time of increasing pressure on the world’s energy resources that so much food should need to be imported into the UK from such unlikely countries of origin. For example, I was going to buy some spring onions recently until I noticed that they came from Peru. And every herb in our local supermarket comes from Israel when it doesn’t come from Kenya or somewhere equally unlikely. I don’t mind this too much when it is things like coffee and bananas that don’t grow here and realistically speaking- can’t. But I draw the line at spring onions from Peru I am afraid. So I didn’t buy them. Growing our own vegetables I will have nice fresh stuff when it is in season, and out of season we are going to try to do without.